Udemy is an innovative educational cloud service that enables everyone to set up their own online classroom, invite people in and use variety of tools to present them with information in intuitive, interactive and easy-to-learn environment. This online platform is based on the principle of incorporating all the modern learning techniques and multimedia features into one easy-to-use interface. By focusing on easy creation and moderation of classes, anyone can build their own course on topic of their choosing, insert into presentation multimedia content such as PowerPoint presentation, audio files, PDFs, interact with users via integrated discussion boards and even create or modify content on the fly while class is in session. 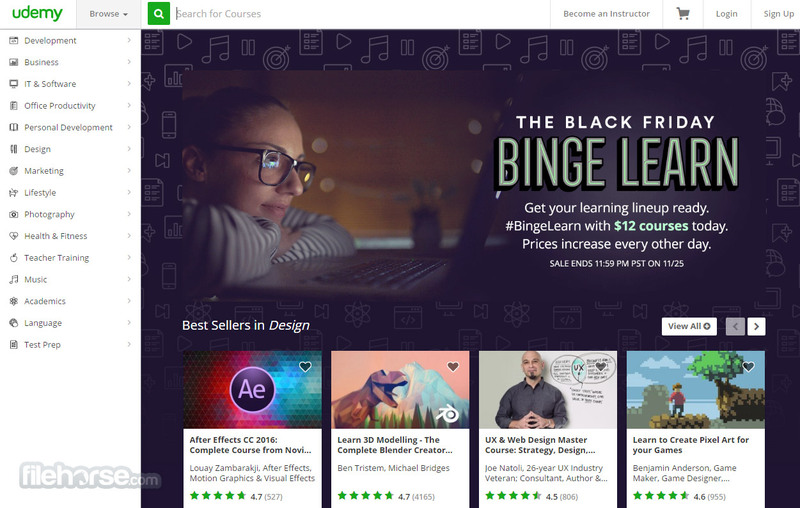 If you are a student, Udemy will enable you to harvest entire power of modern multimedia rich learning, collaboration with distant users, and learn faster like never before. Try it out, top online courses! Access online courses not matter where you are! In the last 5years, internet became home of many online learning platforms that enable users from all around the world to get both basic, intermediate and advanced level experience using various communication methods that can be accessed via the internet. While some services focused on tough sessions, some that have no interactivity, some that are focused on video chat sessions, many other tried to encompass all possible means of communication. Udemy is one of those services, fully capable to tackle all possible classes and engage users of all knowledge levels. This is especially important for instructors, who can use Udemy to remove all the barriers that other services may impose with their limited tools. With good pricing structure, instructors can offer all of their service with ease, and students can enroll into all the classes that they think are important for them. Udemy is an online learning service that allows users from all around the world not only to attend virtual classrooms that cover all the course topics of their choice, but it also allows instructors and educators to hold live sessions. Courses can have various types of materials that are delivered to all students. Those include text articles, PDF files, PowerPoint presentations, Zip files, audio recordings, access to live streamsessions, and fully featured forums where all students and instructors can interact and share information without any restriction. Classes that are offered by Udemy are separated in 16 categories, ranging from Technology, Business, Design, Education, Lifestyle, Social Silences, Music, Sport, Games and others. 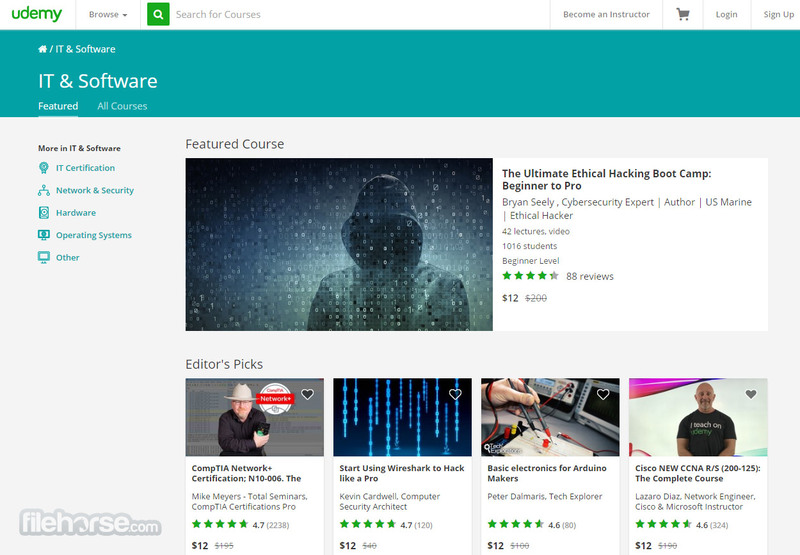 Main page of the Udemy website offers quick access to the most popular courses (all represented with their price, number of students that have accessed it, and rankings). Courses have one-time-purchase price that can vary from free to up to $399, and rarely even more. With over 8 thousand available courses and more than million students, Udemy manages to grow with each passing day, especially because it offers streamlined ability for instructors to create new courses and start their own classes. Everyone can create their own course, create, publish and promote it, attracting users that will attend your sessions and pay for longer curriculums. All of this makes Udemy one of the information resources that you have to consider if you want to expand your knowledge and prepare yourself not only for school and work, but also for all kinds of life challenges. Try it out, top online courses! Interface of Udemy is very modern and well-organized, enabling easy access to all of its features. Main page features links to all main categories of the site (Discover for students, and Teach Online for new instructors). Course listings can be sorted and filtered in several ways, including categories, feature type, price, popularity, reviews, newest and language (English, Spanish, French, Chinese, Portuguese (Brazil), Turkish and Japanese. 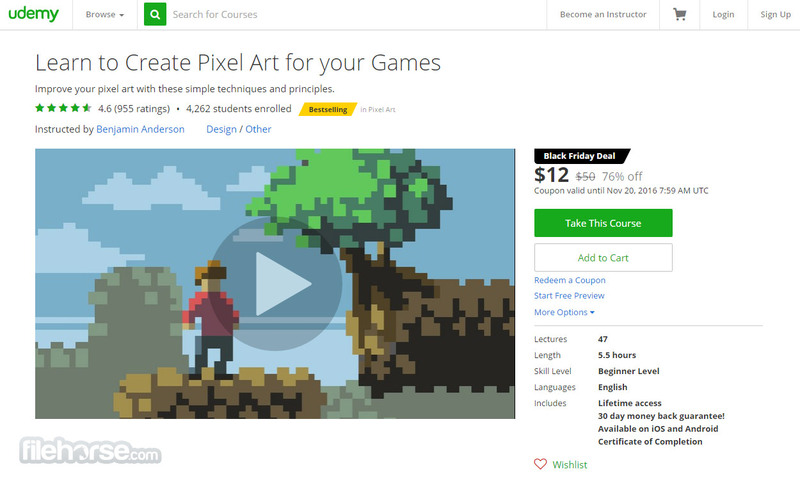 New account on Udemy can be created in mere seconds, either with email address or by connecting with Facebook. As for cost, each individual class has its own price, which can range from free to several hundred dollars. This approach enables students to pick and choose their classes according to their needs and budget. Udemy is a great online academy, enabling anyone to access high quality and affordable classes that can help students and employees to expand their knowledge. Amazing top online courses!